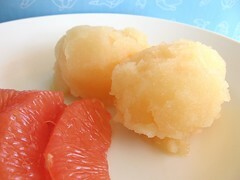 Grapefruit Sorbet - Do You Know The Muffin Man? Notes: The recipe gives the juice measurement in terms of a number of grapefruits and oranges which can vary in size, yield and sweetness. Since the base has about 2 cups of syrup, I aimed for around 4.5 cups of juice. I couldn't find white grapefruit so I used bottled juice instead, and I also substituted limoncello for Campari. Ramsay says to peel, section and puree the fruit, but I just squeezed and strained the juice. This made almost 2 quarts of pure, refreshing citrus sorbet, a definite winner.